Many Pharm Hands were recipients of The Shriek on its bi-weekly journey around the world. 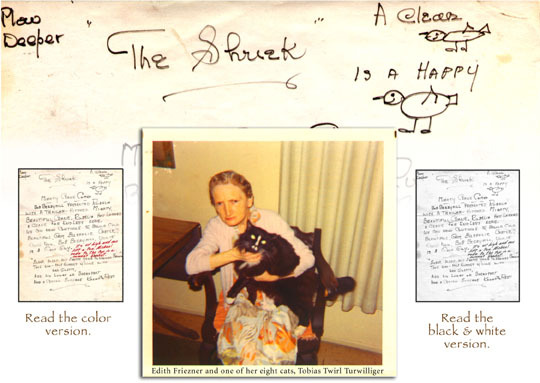 For those of you too young to remember, The Shriek was a newsletter written every other Wednesday by Edith Friezner (a.k.a. The Cleaning Lady) on the big kitchen table of the Main Kitchen of the Tin Palace. Nobody could determine how she would get the Tin Palace clean, because she would always seem to be sitting at the table, feeding Chipper sharp cheddar cheese and writing the newsletter. I believe she wrote all of these between 1968 and 1973. It was always handwritten, never mechanically reproduced (until now) and after spending a week around the Pharm mail boxes for all to read, it was put in an envelope and sent to the First Person on the list. That person would open the envelope, read the newsletter, and then mail it on to the Next Person. In this way, within two years, The Shriek would make its way around the world, eventually coming back to Michael. The newsletter was usually two to four pages of gossip about all the Pharm Hands who had attracted Mrs. Friezner's attention for their misdeeds, which included girl chasing and not taking their shoes off when entering the Packing House. She, being a witch, would hex us at various times. All of us learned to take off our shoes and to try to avoid attention. I hope to be able to find all the newsletters and scan them and post them here, along with other old and maybe new news and trivia. I am copying them here in color and in black and white. If you have a high speed connection, you may find it more charming to read the color versions. Just click on either one above. To read current news and see more links regarding the castle, please see Rubel Pharm dot org. I currently have had time to scan only two Shrieks and have posted them here as a teaser to come back some day for more. The rarest and most precious knowledge is not that which is imposed, but rather, that which is absorbed, inhaled almost, from the ephemeral substance of the world in which we are contained. How many of you still wear an old Pharm T-Shirt? An added bonus to this page. Michael's telling letter to Glen Spear, May 27, 1970, reproduced faithfully from the happiest and most difficult times of the Pharm. Michael had just lost his bid for City Council, defeated by those famous posters showing a couple of children: "because you love them, protect them from Rubel." We were still recuperating from the devastating San Gabriel Valley floods. 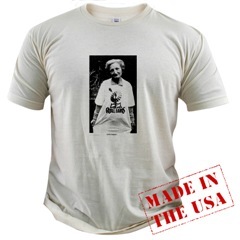 Glen left the Pharm and went to build Mongoose Junction in the Virgin Islands and would send all his communications by tape reel rather than typewriting. We have all listened to your tape recordings and we are all impressed with the amount of equipment you are purchasing. The whole project down there sounds tremendous. We are all pulling for you and we know you can do it if you decide to. Dwayne is talking about coming down to see you this summer. Karen Sue may (I'm sure she will) take Dwayne's place and live there until he returns. Eleanor Riker is enjoying your place and she is a true delight to have here. A beautiful, endustrious, positive, happy girl, and we ALL literally love her. Dwayne dated her heavily, however, at this point it appears, from my tiny vantage point, that Walt Wiley is moving in like the large metal war ship. It is wonderful to watch. Poor Skipper got sat on at the beginning however, he is in possession of a most beautiful, wonderful, pleasant girl: ANN BROWN. I, so jealous I can hardly stand it. However, I keep pooring cement. Cement everywhere. The towers are going very slowly. We must gather rocks and haul them in and mix the cement and work. Well, the hammock seems to monopolize most of my time and this slows down progress. We have lots of help, however. Wonderful new people who add a lot to the Farm. The election was a horrible failure. Even my supporters wonder what happened. It was desastrous. My ego was and is, really smashed. The only solution seems to be poor more cement. Cement everywhere. Everyone is pleased with the way it turned out, so that should make me happy. I am driving a school bus once again, and it is going well. it is not as much fun as driving Bus #11, however, the hours and vacations and other time off pleases my attitude with working. We finished the bird bath structure several weeks ago. it is truly a masterpiece. Much larger than the last structure and all constructed out of palm trees and eucalapedous(sp) trunks. You will be horrified, and I stand about grinning at it. We had thirty people helping to lift the logs into place. It is truly a wonder. The Farm electrical system is so complicated that I can not get a bit of rest. Lights, buzzers, indicators, meters, bells and flashing red and yellow and green lights make my room look like a submarine control room. It is truly a marvel. We turned it all on the other evening after we had had our fill of visitors and for the rest of the evening I sat up in bed at attention, watching the marvelous room change colour and shake. My brother was staying in the living room that evening, and he finally came in to ask if there was anything to be done about the electric room. He claims the door shakes and the relays vibrate so strangely that his bed was giving him a message. We finally turned it off, and this caused the main gates to close, lock and seal automatically, which I forgot would happen when the power was shut off, and then Scott, Eleanor and Klaus came to try and get in. Well, this was four in the morning, and they tryed to use the gate telephone, but when the power goes off they do not work. They tried to open the gates, but they were locked. Then, Scott climbed over the wall, breaking the alarm wire which runs on twelve volts and which in turn set off the horns, bells, and buzzers. I ran out into the world naked as a spider, shot gun in hand. INVASION, I yelled, half asleep, and began methodically shooting it out with the Indians. When all quieted down we had the culprits and everyone got up to have tea. When the main alarm system comes on the lights on the wall, drive, garages and kitchen and living room all come on, which blew my brothers mind. He was fed up, and left at five AM. I think Dwayne is getting tired of the gates and controls he must cope with to get out and in, however, in the Shriek, there is a cry from the Editor to turn off the whole damn thing. She was cleaning the north bath-room the other day and thought she would open the north doors. Well, since we have no use for the north doors, I put micro switches on them so when they open a bell in the north bath room and the electric room come on and stay on for twelve minutes and then goes off, and in so doing (off) turns on the drive lights and my room lights and honks the fire horn three times. Mrs. Friezner was running around and doing what any normal women would do, began to cry. Well, we're going to shut this monster down I guess.